Share the post "Elephant Apple – A Tree With Stunning Flowers"
Dillenia indica is a species in the genus Dillenia native to southeastern Asia, from India, Bangladesh and Sri Lanka east to southwestern China (Yunnan) and Vietnam, and south through Thailand to Malaysia and Indonesia. The genus Dillenia contains approximately 58 to 68 species and belongs to the family of the Dilleniaceae (Dillena Family). Synonyms: Dillenia elongata Miq., Dillenia indica f. elongata (Miq.) Miq., Dillenia speciosa Thunb. This large, evergreen tropical tree is native to forest riverbanks across tropical Asia and grows up to 15 m tall. Its branches are used to make good firewood. The leaves of the Elephant Apple are simply beautiful. Each is papery, glossy dark green and the size of a man’s foot. Undersides are downy and parallel pleats complete the amazing and pretty foliage characteristics. Dillenia indica produces solitary large, 15–20 cm diameter, with five white petals and numerous yellow stamens flowers from June to August. The flowers are short-lived. The knobby grapefruit-sized fruits are yellow-green, and ripen with a leathery brown covering and many interior brown-black seeds. The fruits are edible. They are crisp and aromatic (almost onion-like) with an acid flesh. Unripe fruits are often pickled or used as chutney. An interesting study in the Buxa Tiger Reserve by ecologists Sekar & Sukumar has shown that Asian elephants appear to have a particular fondness for the fruits of Dillenia indica, so they are an important seed dispenser for this tree. Because Elephant Apple is a main source of food for elephants, monkeys and deer, it is prohibited to collect fruits from the core areas of the forest. Commercial sale of the fruit is also prohibited in order to help the food-chain system of the forest from dismantling totally. Dillenia indica preferes full to partial sun and an acidic, humusy soil with average drainage. The best conditions for this tree is lots of heat and high humidity. It’s sensitive to cold, but will survive a brief encounter with frost. Dillenia indica was brought to Brazil by the Portuguese. The legend says that D. Pedro I of Brazil (D. Pedro IV of Portugal) sent the fruits of the Elephant Apple tree to Portugal with the message “In this land money grows on trees”. When the Portuguese opened the fruits they’ve lost their speech! All the fruits had patacas’ coins (the Brazilian currency) inside! D. Pedro in such a way wanted to symbolize the natural richness of Brazil. The trick was so good that even today people from Portuguese speaking countries keep talking about the Patacas’ tree as a hypothetical easy way to make money. But how did the fruits had coins inside without being opened before? The Elephant Apple tree is known in Brazil also as the chest-fruit tree, and the origin of this name is the key to solve the mystery. 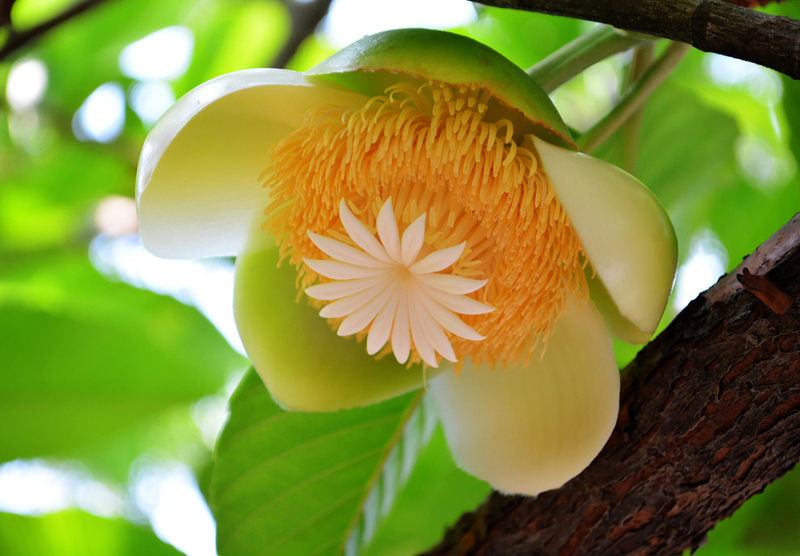 When the flowers of Dillenia indica are fertilized, the fruit grows in the middle as usual, however, also the petals start developing and growing around, becoming juicy, edible and protecting the fruit inside. So, what you place in the flower (between the ovary and the petals) remains there, and obviously the coins that D. Pedro placed in the flowers remained inside until fruits got ripe and someone got them. The fruit pulp is bitter-sour and used in Indian cuisine in curries, jam (ouu khatta), and jellies. It is often mixed with coconut and spices to make chutneys. It is extensively used in Dal and in fish preparations in Assam. – Studies have shown that Dillenia indica might be a potential source of antidiabetic agents. 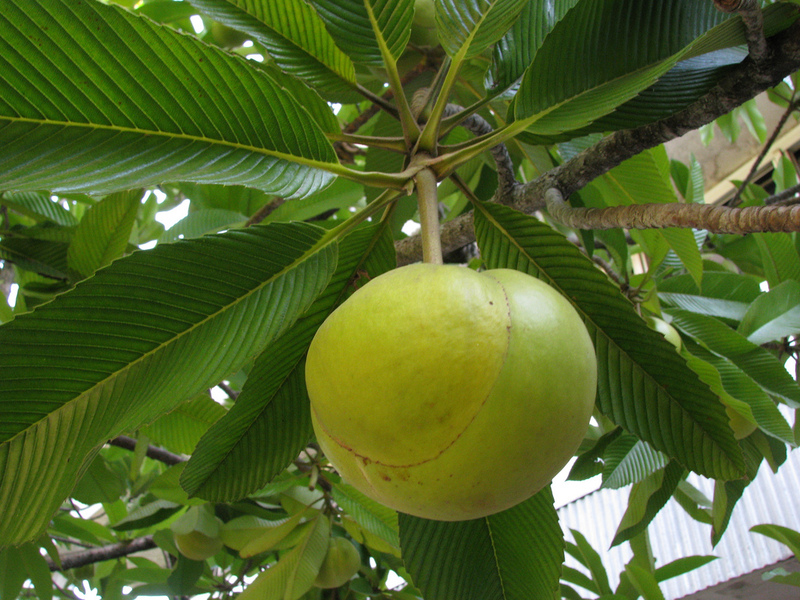 – The fruit of Dillenia indica is rich in phenolics may provide a good source of antioxidant. – Fruit extract of Dillenia indica exhibits anti leukemic activity. – Bark of Dillenia indica is a component of medicine for sores caused by mercury poisoning. 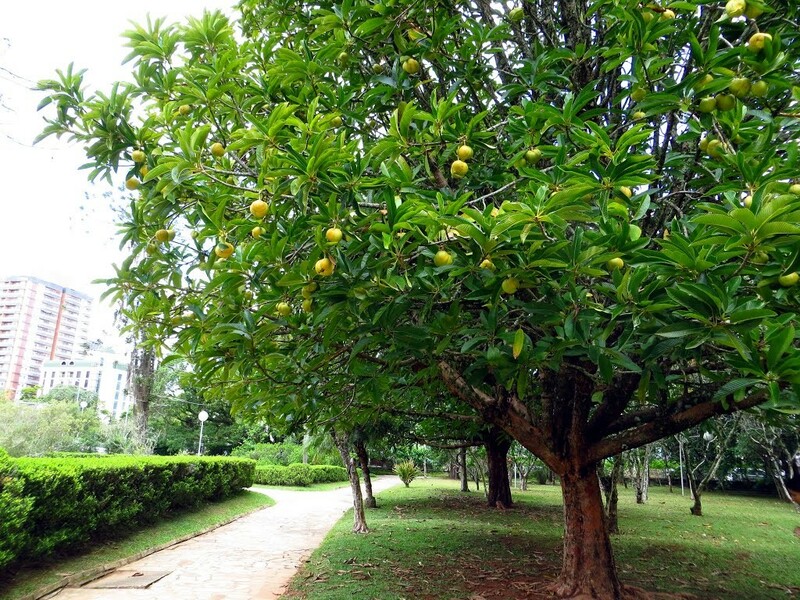 Elephant Apple tree is used in Ayurveda and Sidha. Bark, leaves and fruits crushed and the juice drunk for cough, cold, fever, diarrhea, stomach disorders. Dry bark with seeds of Sesamum orientale made into a paste applied on blistering boils; bark and leaves used to stop bleeding. Leaf and bark of the tree is used as an astringent and laxative, the bruised bark, externally as a cataplasm in arthritis, and the fruit juice as a cough mixture, a cooling beverage as also for toning up the nervous system. It is considered a ‘vata’ suppressant, ‘pitta’ augmenting drug in Ayurveda. The fruit is slightly laxative and induce diarrhoea, if taken excessively. The juice of the fruit, mixed with sugar and water, is used as a cooling beverage in fevers and as a cough mixture and also as a cardiotonic. The plant is aphrodisiac and promotes virility. Disclaimer and safety: Please note, all information on this website is for education purposes only. This website is not medical advice, so please check with your doctor before using plants for any health problems or advice, and especially if you are pregnant, using medications or have other health conditions.